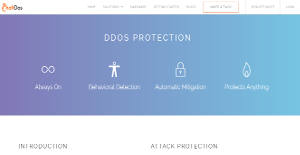 HaltDos DDoS is a patent pending intelligent DDoS mitigation solution created to track, identify, and automatically protect against DDoS attacks. The system does so without human intervention. HaltDOS DDoS utilizes a heuristic, behavioral and reputation-based anomaly detection. It also includes automatic signature deployment. With HaltDos DDoS, your websites and all your web services are protected from various forms of attacks that can compromise your security and all the sensitive information your website and web services contain. These attacks include TCP Flood, SYN Flood, ACK Flood, PSH+ACK Flood, HTTP Flood, UDP Flood, DNS Flood, and DNS Amplification to mention a few. HaltDos DDoS ensures that all your websites and web services are secured and protected from high volume network attacks. With its combined network behavioral analysis (NBA), heuristic and reputation techniques, HaltDos DDoS is able to identify and isolate anomalies like detecting bot traffic from legitimate user traffic. The system is also designed to implement total protection against emerging network threats and ensure that your network performs at the optimum level even when the network is already under heavy attacks. With HaltDos DDoS, legitimate network users are able to access the network and its sub locations even when the system is under attack. That is because HaltDos DDoS generates real time signatures for each attack pattern and blocks all attacks accurately without impeding legitimate user access. The application is also designed to adapt quickly to the changing network conditions, thanks to its self-learning capability. HaltDoS DDoS is able to adjust its security configurations automatically without requiring human intervention and instantly generates real time signatures whenever the network is under attack. HaltDos offers a multi-layered network security, integrating network behavioral analysis (NBA), heuristic and reputation techniques to spot bot traffic from legitimate user traffic. With its low latency and huge capacity to handle high volume and sophisticated network attacks, HaltDos DDoS is capable of maintaining excellent user response. It is essential to realize that virtually no app in the IT Management Software category is an ideal solution able to meet all the goals of various business types, sizes and industries. It may be a good idea to read a few HaltDos DDoS reviews first as specific services can excel just in a very narrow set of applications or be prepared with a really specific industry in mind. Others might work with an idea of being easy and intuitive and consequently lack complex functionalities desired by more experienced users. There are also solutions that support a large group of users and give you a rich feature set, but this usually comes at a higher cost of such a service. Make sure you're aware of your needs so that you get a software that provides exactly the functionalities you search for. How Much Does HaltDos DDoS Cost? A 15-day free trial is also available. We realize that when you make a decision to buy IT Security Software it’s important not only to see how experts evaluate it in their reviews, but also to find out if the real people and companies that buy it are actually satisfied with the product. That’s why we’ve created our behavior-based Customer Satisfaction Algorithm™ that gathers customer reviews, comments and HaltDos DDoS reviews across a wide range of social media sites. The data is then presented in an easy to digest form showing how many people had positive and negative experience with HaltDos DDoS. With that information at hand you should be equipped to make an informed buying decision that you won’t regret. What are HaltDos DDoS pricing details? What integrations are available for HaltDos DDoS? If you need more information about HaltDos DDoS or you simply have a question let us know what you need and we’ll forward your request directly to the vendor.